But about a year ago, I decided to whip up a batch of veggie burgers for a class. The focus of the class was on vegetarian substitutions and I couldn’t ignore my nemesis any longer. So I did some research, had several failed culinary attempts (edible, but not worth sharing), and then stumbled on this creation. In my view, it’s a veggie burger done right. It’s made of black beans. Japanese breadcrumbs, called Panko, keep the burger from being too dense and help create that ideal burger texture. An egg works as a binder to hold everything together and cilantro, garlic, and Monterey Jack cheese provide flavor. The final and most important addition is one chipotle en adobo. For those that aren’t familiar with chipotle en adobo, familiarize yourself with it. It’s a favorite secret ingredient of mine. The chipotle pepper is a dried and then smoked jalapeño. You can find it canned en adobo (a spicy sauce made from vinegar and chilies) in the Mexican aisle of your local supermarket. A little chipotle goes a long way and adding one minced chipotle pepper en adobo to your burgers gives them a great smoky flavor that mimics that of the grill. For those that worry about heat, the spice of the chipotle pepper is more subdued than that of a fresh jalapeño. However, if you abhor the picante, simply use a little of the adobo sauce instead of the chipotle pepper. The sauce will give you the same benefits as the minced chipotle, but without as much of a kick. 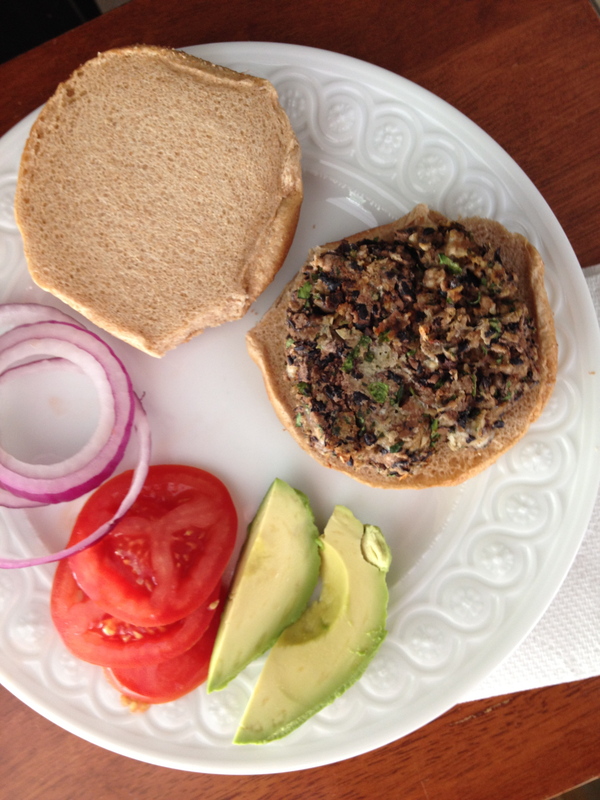 I find it easiest to cook these black beans burgers in the oven, but you can certainly cook them on the grill as well. Easily made in advance, these would be great to pull out at your next cook-out. In terms of condiments, the usual accoutrements like ketchup, tomatoes, onions, and mustard work great. However, if I’m feeling spicy, I’ve been known to heat things up with a little salsa and some avocado slices for a Mexican twist. Finally, I would be remiss if it I didn’t tell you to rinse your beans before using them. Canned beans, while convenient, pack a sodium wallop. A quick rinse before using will cut the level of sodium by almost half. In short, it’s worth the trouble. Enjoy! Want to see how to make these burgers? Click here to see my cooking demonstration on the Charlotte Today Show. Preheat the oven to 375 degrees. Place the black beans in a food processor. Process until the mixture is mostly smooth with a few lumps. Add the black beans to a large bowl and stir in the cilantro, cheese, minced chipotle, panko, salt, garlic, and the egg. If the burger is too sticky, add a little more panko. Divide the mixture into four portions and shape each portion into a ½-inch thick patty. Line a baking sheet with parchment paper or spray with cooking spray and place the hamburger patties on the baking sheet. Bake for 10 minutes, then flip the burgers over and continue baking for another 10 minutes. 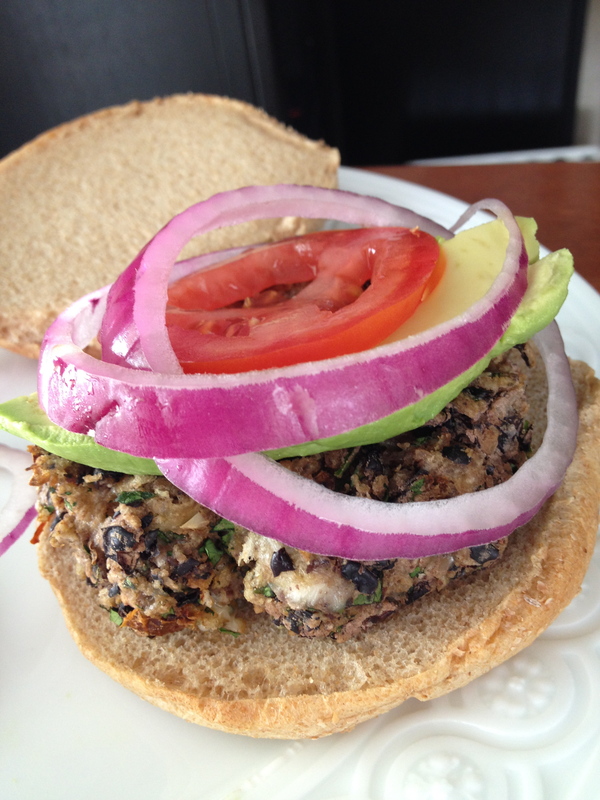 Serve the black bean burgers hot with preferred condiments. I made these last night and they were FANTASTIC!! Thanks for sharing and trying so many so I didn’t have to 😉 I also used some of the adobo sauce and mixed it with a little mayo to make a chipotle mayo to go on the bun! DELICIOUS!! these are awesome! like you, i feel a veggie burger could never replace a juicy cheeseburger. but these are in a league of there own goodness. i saw you make them on charlotte today, and when i saw the look on colleen’s face after she tasted them, i knew i had to try them! What a nice comment to receive! I am so glad you enjoyed them. It is nice to have a good alternative to the juicy hamburger every now and then! Happy cooking! These sound amazing. I have been on a huge veggie burger kick too. Thanks Food Love. Love the adobe pepper idea too. Thanks, Jon! You will have to try them out and let me know how they compare to other veggie burgers you like. Thanks for reading.